It had been nearly eight years since I had on my acrylic nails or even stepped into a nail salon when I was approached about a grand opening of a new nail salon in the city of Costa Mesa, California. 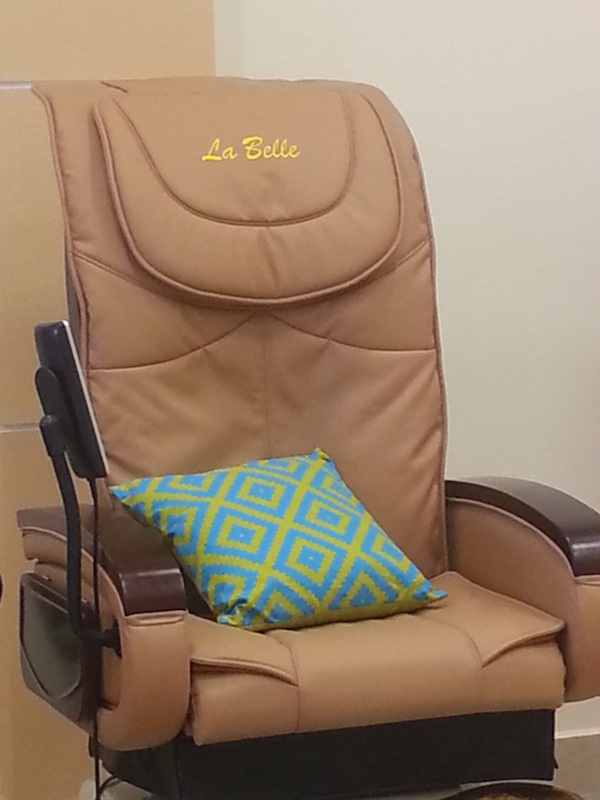 I decided on my day off to go check out the place, La Belle Nail Spa and see what they had to offer. With a grand opening date of June 9th, I must say it appeared to be that the nail salon had been running smoothly for years. La Belle Nail Spa is located in a convenient location in central Orange County in the city of Costa Mesa off of Harbor and Adams. As I entered the store, they seemed to be booming with business. As I entered the salon, the owner Michelle Bui came over to greet me and welcome me into her store. She was very pleasant and friendly as I shook her hand that she extended with a smile on her face. The store had apparently been regutted and had all new equipment throughout. There was a round area in the front for people to have their nails done as well as massage chairs throughout the store to enjoy a relaxing massage from the amazing chair while having your nails manicured and a pedicure for your feet. There was one flat panel TV on the back wall for guests to view televised productions if they chose to do so while being pampered. I was pleasantly greeted by another “nail doctor” in the store offering me a pedicure. As I laid back into relaxation while having a massage on my back from the therapeutic chair, one woman massaging my feet, and the store owner Michelle Bui prepping my nails for their acrylics, I proceeded to ask how La Belle Nail Spa began. Michelle told me of how she was from Vietnam and moved to California with the dream to work hard and support her family. She worked very hard in a nail salon and went to school to study and obtain certification to work on nails and to learn English. Upon working for 8 years in someone else’s salon and going to school, as well as supporting her parents and her teenage son, she was finally able to live her dream and open her own salon. 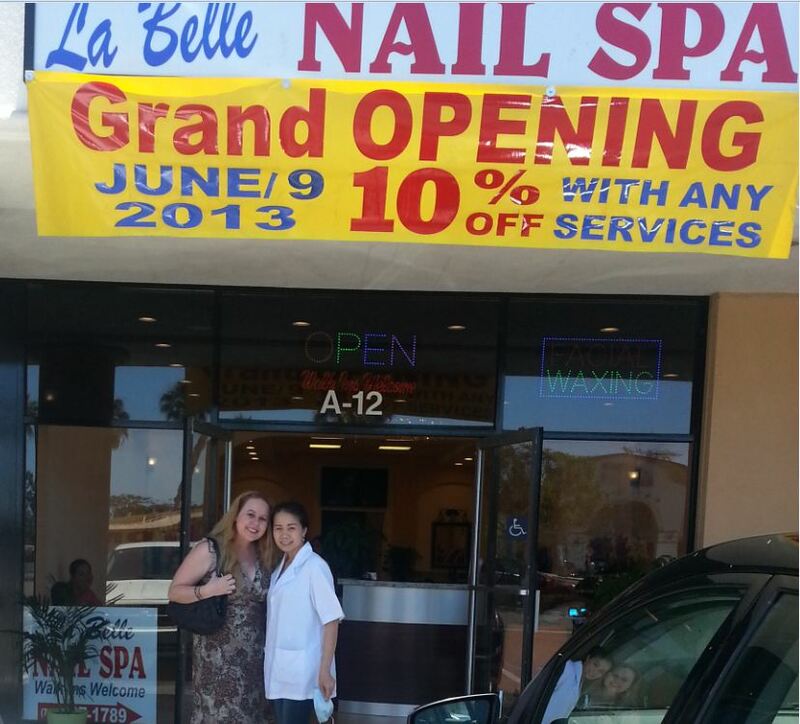 With this, La Bell Nail Spa was born on June 9, 2013 on Harbor & Adams in Costa Mesa. 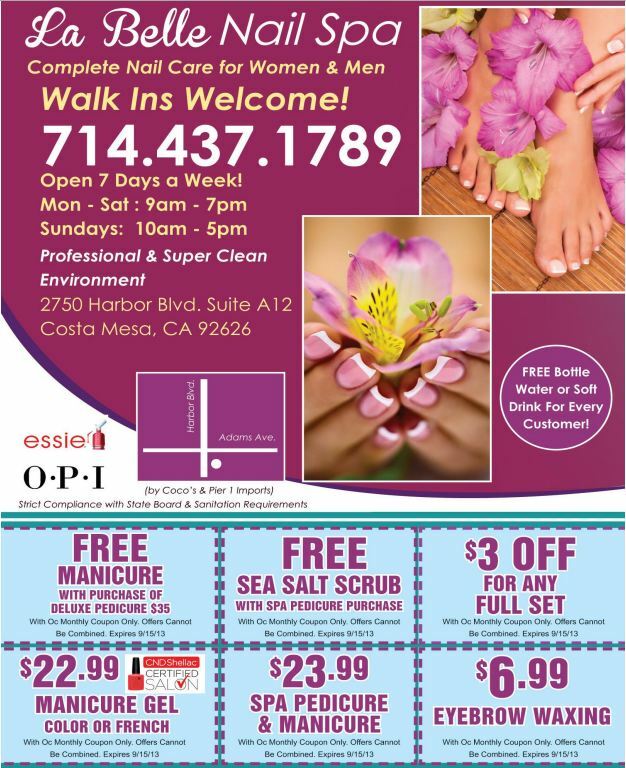 Since La Belle Nail Spa is a new store, there are several promotions going on as of now that I would like to make you aware of. There is currently a 10% off special going on for all services. Please see my About Me Section for contest disclosures! Good luck! My sister just moved to OC from LA! She would love this nail salon gift card as a gift! Always looking for new good nail places! This looks like a really nice nail salon! Close to my house, do they do “gel” nail polish vs just a paint nail polish? Jessica, That is awesome!!! I know what you mean about having a place nearby:) I totally agree! So…how did your nails come out?? I wanna see!!! I would love to get a manicure-pedicure coupon with a bit of a foot massage and a pretty little nail art on my toes. Yes, I want “flower”! 🙂 Thanks, Danielle! I recognize those toes anywhere! A pedi for an upcoming wedding I’m matron of honor to. Awesome! Congrats:) Good luck on my contest! I love being pampered occasionally. It is fun going to the spa and getting my toes done. I love the nail art, I need to try that next time I go. Thanks for the comment Christy:) Getting toes done is a special treat! :) I have never done nail art myself either! Looks fun! Yes it does look fun. I really need to have my feet professionally taken care of in a few weeks. I wear sandals all the time so my feet have a tendency to dry out. How fun to be invited to a grand opening of a new nail salon and spa. What I wouldn’t give to be sitting in one of those massage chairs enjoying a foot massage, pedicure and manicure, too. As for the raffle, well I live too far away to enjoy; however, I have relatives in the area and I’m sure they would love the gift of a day of being pampered. looks like a nice clean place to get pampered. You are right, this is a beautiful salon! I plan to get my nails done with my play money. Do they have a location near me? For sure:) Love these guys! I wish to have such a great place near my hometown… Greetings from Italy!!! Love it!! I love Italy!! I have been to Venice, Florence, Rome, & Assisi. What a beautiful country! Where are you located? Looks like you had a blast! .. or was it a relax!! Either way, I’m glad you had a wonderful experience!! Love going to the Spa! Look at all those amazing nail colors! It’s good to be pampered. Sounds like you’ve found a place that does it well. What a great and inspiring story, that makes me happy for Michelle! I love all the nail polish colors too! I will share on all my social media outlets….Good luck! Oh my gosh, that nail art is beautiful! 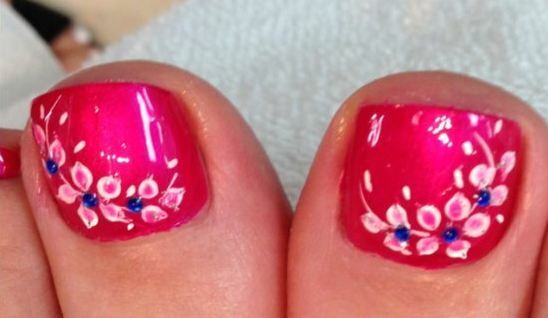 The pink toenail paint with the tiny flowers is very cute and summery. I have retweeted to the kungphoo peeps! Can you please move closer?! 😉 I really could use a mani pedi!!! Great post and I have shared it with my Cali friends. I love what you share! Sometimes the hardest thing is picking out the color and design you want!! You cannot go wrong with free gift cards right? Treat yourself girl. Looking great! wow this is really awesome! I love nail polish! Good to know about new grand openings in the region. The salon looks neat, thanks for sharing the info! Thanks for the comment Meire:) It is a great little place! This looks like a great place… I am soooo overdue for a pedicure! You find such cool things … but then geography is a problem. Wish I were closer to you … or had a Dani closer to me!